The State of the Future Index is an indication of the 10-year outlook for the future, based on historical data of selected variables for the previous 20 or more years and on judgments about the best and worst plausible 10-year outcomes for each variable. It is constructed with key variables that are individually forecast and that in aggregate can indicate the potential trend of the future. The SOFI is intended to show the directions and intensity of change and to identify the factors responsible. It provides a mechanism for studying the relationships among the items in a system — how making a single change ripples throughout a system, in other words, creating some positive and intended consequence as well as unintended results. The SOFI is useful for assessing the consequences of different policies and for showing the combined potential outcomes in an easy to understand fashion. It has been produced by The Millennium Project since 2000. For the methodology, see “State of the Future Index” in the Futures Research Methodology section of GFIS (http.themp.org). The variables included in the 2015 SOFI, as well as their respective weights (importance to the system), and the “best” and “worst” values in 2025 have been decided through RTD studies and updated by the Millennium Project staff. The sources of data have been carefully considered, are deemed to be reliable, and have good historical data records. However, combining many variables into a single index number can lead to loss of detail, compensating losses in some areas with progress in the others; this could smooth the look of the SOFI line, as well as mask variations among sectors, regions, or nations. The apparent precision of an index should not be mistaken for accuracy. For these reasons, many people interested in tracking social or economic conditions prefer to keep the variables that they consider important separate and distinct. SOFI has been constructed for the global level as well as for countries. Some of the Millennium Project’s experiments with the index have illustrated how it might be used for policy purposes by demonstrating the effects of proposed policies on a nominal State of the Future Index. By using standard variables for constructing national SOFIs, it allows comparisons among nations. The variables included in SOFI were selected from a set of indicators rated by an international Delphi panel for their capacity for showing progress or regress on the 15 Global Challenges and the availability of at least 20 years of reliable historical data. The variables were submitted several times to an international panel selected by The Millennium Project’s Nodes to forecast the best and worst values for each variable in 10 years. These were used for the normalization and integration of all the variables into a single index and for computation of the State of the Future Index. Online historical data sources for essentially all the variables were obtained, although some manipulation was required, and the data were fit with time series equations to both interpolate missing data points and to obtain forecasts for the next 10 years. 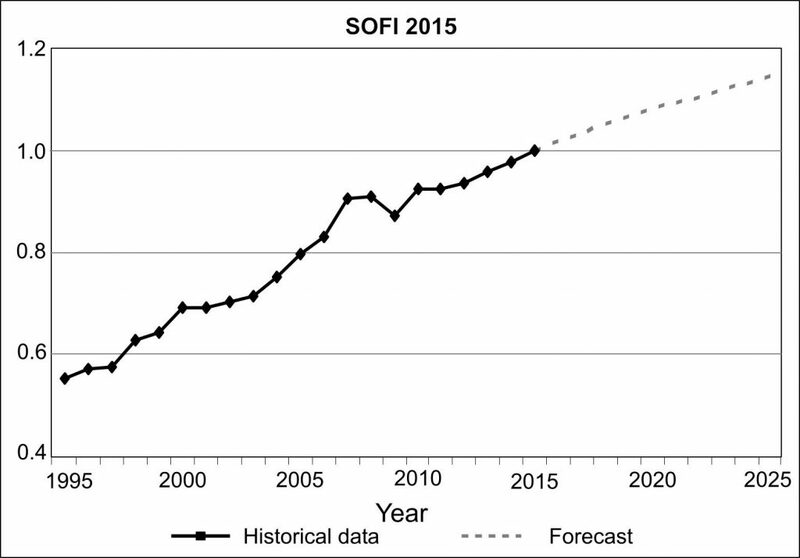 The 2015 SOFI indicates a slower progress since 2008, as a prolonged effect of the economic turmoil, although the overall outlook is promising. One of the advantages of computing the SOFI is the identification of the areas where we are winning or losing or stagnating—thereby helping set priorities. The following figures show where humanity is making progress and where more political attention and efforts are needed. This can be further analyzed by assessing the individual variables and their potential trajectories.